Flush with the financial success of the first three novels, the cousins quit their day jobs. 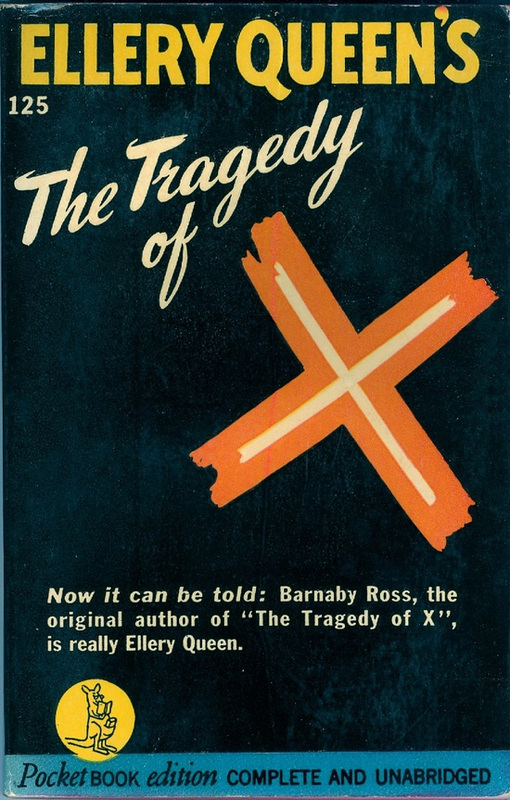 Not wanting to flood the market with Ellery Queen, they created author Barnaby Ross, who wrote the Drury Lane mysteries. The four Drury Lane mysteries have always eluded me. I have avoided them, and this seems like an apt time to explore this fresh and interesting ground, this new suburb of the Queen metropolis. The Tragedy of X introduces Drury Lane, an eccentric retired successful Shakespearean actor who solves unsolvable crimes in his spare time, while trained and experienced police detectives stand around scratching their heads in bemused amazement. It’s a formula that has worked with popular amateur detectives from Sherlock Holmes to Shawn Spencer: the success rests almost entirely on the eccentricities and chemistry between the main character and their sidekick. So, of course, Drury Lane is an unusual character: he sunbathes in swim trunks on the roof of his remote castle on the banks of the Hudson River. He constantly quotes Shakespeare, mainly Hamlet, and even calls his castle and surrounding artificial Elizabethan village “The Hamlet.” The police are standard issue for such mysteries, and the revenge plot is easy to unravel, yet, the book is a good read. The characters, as much as the mystery, transport the reader. The characters, themselves, enjoy all modes of public transport: the first murder is on a trolley, the second on a ferry, the third on a train. Social mobility is the theme, for the victims and the detective. For some mobility leads to dastardly deeds, to others, good things come. The staid, unimaginative forces of the government falter, but the enterprising individual, standing outside the constrictions of the bureaucracy, can thrive and survive. However, those who run afoul of the law are doomed, those who work with the law are heroes. Such were the themes in the last days of prohibition, in the throes of the Great Depression, when distrust of the law and the government, and for the free market and predatory entrepreneurs were at a height. The first EQ novel (though this with Drury Lane) to lay out the concept and philosophy of the dying message clue: “There is no height to which the human mind cannot soar, godlike, in the instant before death.” What a great line, especially as delivered by a former stage actor!